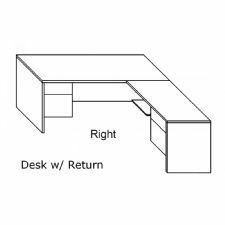 2100 Series Desk with Return, 21-DR-3672-2047 Features: 21-Dsp-3672 3' x 6' Desk. 21-Ret-2047 20" x 48" Return. $176 List to add 6” increments ($122 List cut downs). Flush Returns are standard. Full Modesty Panel is standard on main unit. For locks, add $64 list and specify lock. 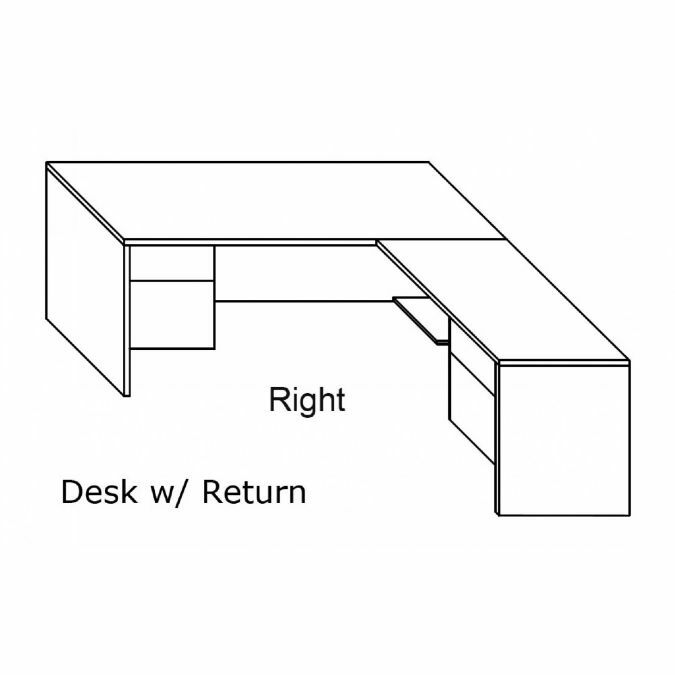 Specify RIGHT or LEFT Return. A collection of contemporary laminate casegoods that is designed to fit any budget featuring unlimited shapes and sizes to fit the most demanding work environment. James Edward warrants to the original purchaser that: James Edward casegoods products will be free from defects in material and workmanship (excluding finish) under single shift usage for five (5) years from the original date of purchase. James Edward warrants the finish of its products under normal usage for one (1) year from the original date of purchase. This warranty is made solely to the original purchaser of record and shall be effective from the date of purchase as shown on the purchaser's receipt. This warranty is void for any damages to the James Edward product due to misuse, abuse, neglect, accident, improper installation, failure to comply with instructions furnished by James Edward or any repair or alteration performed by anyone other than James Edward or an authorized James Edward dealer. Damage caused by common carrier during shipment is not included in this warranty. During the warranty period, as set forth above, if any James Edward products sold, which are subject to this warranty, prove to be defective in material and/or workmanship under normal use, the purchaser must contact an authorized James Edward dealer or James Edward in writing or by telephone to arrange for inspection of such James Edward product by an authorized representative. The James Edward representative, after inspection, and at their sole discretion, will issue a return authorization for such James Edward product. No James Edward product will be accepted for return without prior authorization from James Edward or an authorized James Edward representative. James Edward shall, at its option, either (1) provide parts necessary to repair such James Edward product free of charge, or (2) issue a mutually acceptable credit for such product. THE FOREGOING LIMITED WARRANTY IS JAMES EDWARD'S ONLY WARRANTY, WRITTEN OR VERBAL ON ITS PRODUCTS. NO OTHER STATEMENT, AGREEMENT, OR REPRESENTATION BY ANY PERSON SHALL BIND JE. EXCEPT AS SET FORTH ABOVE, THERE IS NO WARRANTY, REPRESENTATION OR CONDITION OF ANY KIND, EXPRESS OR IMPLIED (INCLUDING, BUT NOT LIMITED TO, ANY WARRANTY OF NON-INFRINGEMENT, MERCHANTABILITY OR FITNESS FOR A PARTICULAR USE OR PURPOSE), AND NONE WILL BE IMPLIED BY LAW. JE WILL NOT BE HELD LIABLE TO DEALER OR PURCHASER OR ANY OTHER PARTY FOR ANY PUNITIVE, SPECIAL, CONSEQUENTIAL OR INCIDENTAL DAMAGES OR FOR LOST PROFITS OR GOODWILL RESULTING FROM ANY BREACH OF WARRANTY, NEGLIGENCE OR ANY OTHER CAUSE OR THEORY.